The Val de Somme is a paradise for hikers. Whether on foot, bike or horseback, and whatever your level, let us guide you through the beautiful scenery and the proposed circuits. Unwinding in a countryside setting also means taking time for a walk in the open air. And there’s no shortage of opportunities for that in Val de Somme. With breath-taking landscapes, protected biodiversity, and specially created paths, the region is an ideal destination for walkers. The circuit takes its name naturally from the outline in the shape of a shoe. This route passes through different landscapes: woods, pastures, grassland and rivers all, situated in a nature conservation area. Start: rue du Pauchelet to La Neuville-Corbie. On a bike, you will have the impression that the region was made for you. Whether taking a short ride or a long round trip, trying out a new sport or on a cultural outing, with or without children, you are bound to find a route suitable for you! For the brave, there is a 2hr 30 min circuit (42 km) which sets off from the square in Corbie and takes you through the Somme, Ancre and Hallue Valleys. You can also follow a shorter but more difficult circuit (34 km, 2hr). 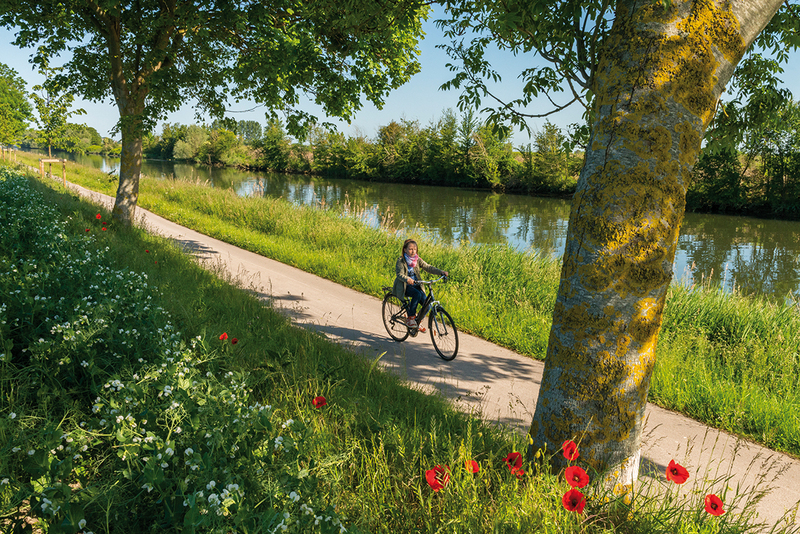 For others, the Vallée de Somme Veloroute will satisfy all your requirements for a cycle trip. As you travel along the Somme River from east to west, there are numerous options for stops and visits. Finally, Veloroute n°32 de la Mémoire will take you to Amiens or Arras as you discover the major First World War sites of our region. Whether you are alone or with the family, the Calypso aquatic centre is the perfect place to relax. Here you will find a sports pool where you can swim with complete peace of mind, and fun facilities such as a counter-current pool and a four lane waterslide. The sauna, the bubble plates and massage showers all offer great opportunities to relax. This lock keeper’s house, which was renovated by the Departmental Council of the Somme and is managed by the Arts and Découverte Association, is part of the “Maisons de la Vallée” network. Set on the banks of the River Somme and the Vallée de Somme veloroute, it is the perfect place to stop off during your cycling trip or walk. Vincent and Arnaud offer light meals (picnic basket), a grocery store with local produce, market garden produce, exhibitions, concerts and activities for everyone. For the very young: Creative workshops on games from the Picardy area and grand treasure hunt with Armel Baba: For the older ones: Drawing and watercolour workshops, music sessions and exhibitions by local artists and photographers. Electric boats for short and long trips with friends, partners or family.